It’s been quite a while since our last update announcement; almost a month and a half – and we’ve blasted through the last of our remaining todo list as part of giving the site the final coat of polish it needs to really shine. We’ve been very quiet, mainly because there’s been a lot going on (both in developing Furry Network and in other projects) – we hope to change this up and make things a lot more active in the coming weeks, now we’re getting the last few items finished up site-wide. With that said, we have a jumbo update for you – this time, featuring some much-requested features, including Profile Pages, Journals and better navigation. Character profiles now have customizable home pages! 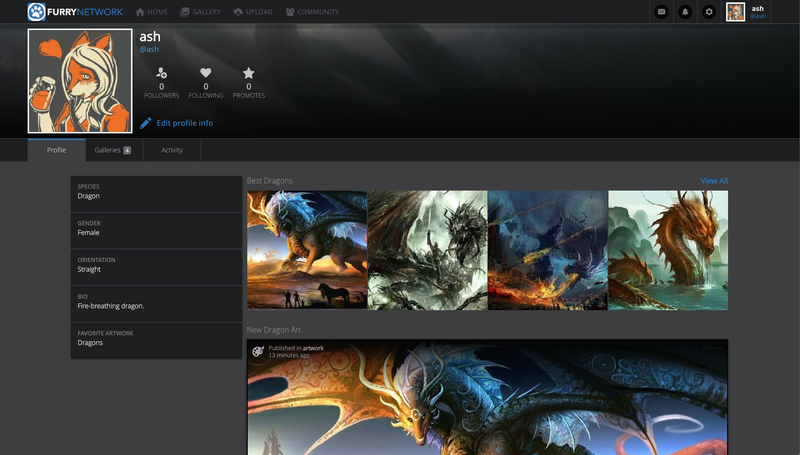 You can now feature sections of your profile including any media galleries (artwork, photos, stories, etc. ), highlight a single submission, or get creative with some Markdown text. Journals are now supported. To add a journal, simply visit your submission manager by clicking “Upload” in the navigation and adding them to your profile. Unlike Stories, Journals will only appear on your profile and your followers’ activity feeds, not in the general site-wide new/popular galleries. Journals support all the same functionality of other site content including comments, tags, favoriting and more and can also be featured on your homepage. 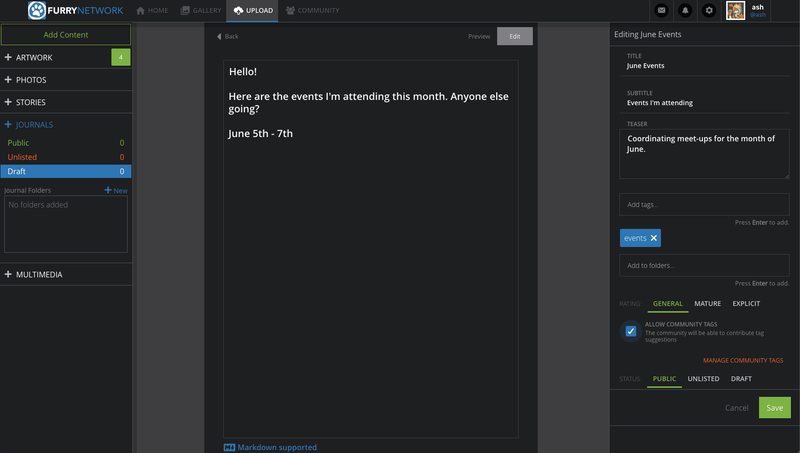 Improvements were made when viewing single submissions throughout the site to appear in a modal instead of a new page to allow for a better browsing experience. Now you can close the submission and go back to what you were previously viewing, even if you’ve scrolled down on a feed. You can also use your arrow keys to navigate between submissions, favorite, promote and close what you’re currently viewing. If you wish to view something in a new tab, you can click Download. Hover over the compass icon in the lower left of the screen to view thumbnail navigation. 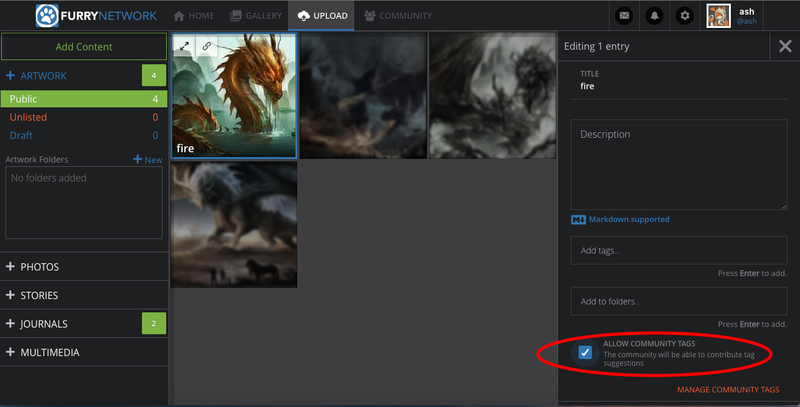 Artists and admins now have control over managing community tags on submissions. Artists can disable community tags on a per-submission basis from the submission manager while editing one or many submissions. 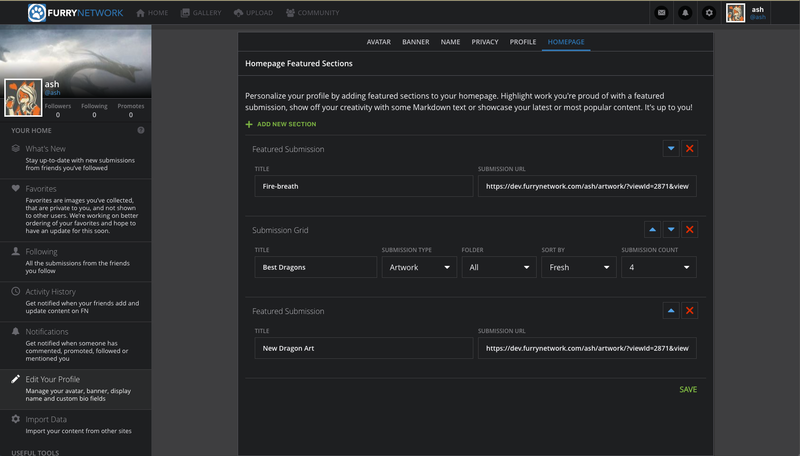 Artists can manage community tags from both the submission page and the submission manager, either adding them to the block list for that submission (clicking the X) or promoting them to artist tags (clicking the checkmark). Artists have a button at the bottom of the community tag modal to list and delete their blocked tags for that submission. Users can now flag community tags. Admins can review the ticket, which includes a link to the submission, the user who added the community tag, and the user who flagged the tag. You can now optionally prevent submissions from hitting What’s New or Fresh feeds. In the submission manager, there is a new Publish All button on draft pages that will move all current drafts to public. Checking the “publish my submissions…” checkbox will publish them in the Fresh feed and followers’ What’s New feed. Leaving the box unchecked will only make the submissions public, and they will not appear in What’s New or Fresh Feeds. Each submission can only be published one time to avoid spam. We have updated the header to now show links for Home, Gallery, Upload and Community. There is also a message notification icon next to the general notification icon, and a settings dropdown. Gallery takes you to the Most Popular and Most Recent feeds for submissions. Upload will take you to your submission manager. 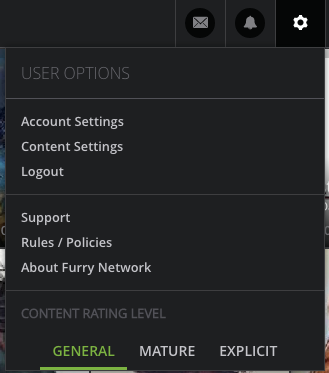 The Settings dropdown includes account and content settings, logout, support, rules/policies, about and the content rating switcher. Character profile home page. Character profiles now have customizable homepages! 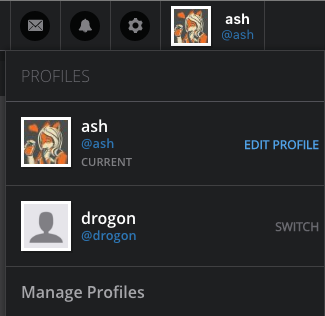 You can now feature sections of your profile including any media galleries (artwork, photos, stories, etc. ), highlight a single submission, or get creative with some Markdown text. You can go to Edit Your Profile to add and manage what is displayed on your homepage. Journals. To add a journal, simply visit your submission manager by clicking “Upload” in the navigation and adding them to your profile. Single Submission View Improvements. Improvements were made when viewing single submissions throughout the site to appear in a modal instead of a new page to allow for a better browsing experience. Now you can close the submission and will go back to what you were previously viewing, even if you’ve scrolled down on a feed. Community Tag Updates. 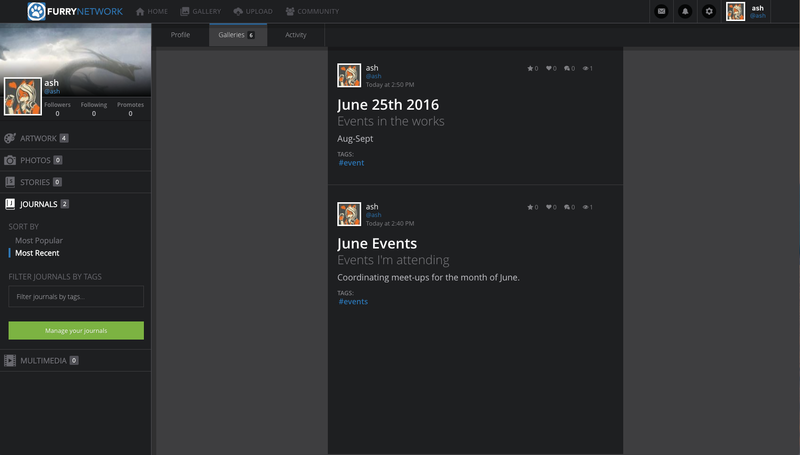 Artists and admins now have control over managing community tags on submissions. Artists can disable community tags on a per-submission basis from the submission manager while editing one or many submissions. If a user tries to add a community tag that has been blocked by the artist, the user will receive a validation error. They will also receive an error if the tag already exists. Users can only remove community tags that they have added. Optionally prevent submissions from hitting What’s New or Fresh feeds. In the submission manager, there is a new Publish All button on draft pages that will move all current drafts to public. Checking the “publish my submissions…” checkbox will publish them in the Fresh feed and their followers’ What’s New feed. Leaving the box unchecked will only make the submissions public, and they will not appear in What’s New or Fresh Feeds. Each submission can only be published one time to avoid spam. Header Redesign. We have updated the header to now show links for Home, Gallery, Upload and Community. There is also a message notification icon next to the general notification icon, and a settings dropdown. (we will be adding a search to the header as well, it’s just currently disabled). Users are able to switch characters by clicking on their picture in the upper right. Clicking “Upload” takes users to their submission manager. “Gallery” takes users to a page where they can switch between fresh/popular feeds for all content types. We’re excited for all these improvements, and can’t wait to see what creative things you get up to with them! We will be focusing on clearing out our backlog of changes, policy updates and general documentation improvements site-wide, as well as squishing any last few remaining bugs. In addition, we’ll be putting together some how-to guides, as well as useful markdown references / copy-paste examples you can use to make your profile beautiful (as well as accomplish common tasks). We will also be adding a ‘jobs’ page, which we will be using to recruit some more staff onto our team! Once we’ve gotten these out of the way, the real fun begins: Commissions!